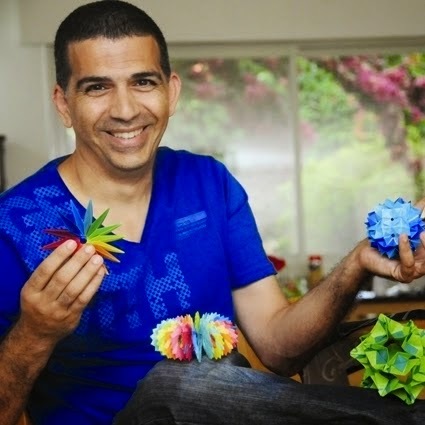 If you're a longtime reader of this blog, you might remember Ilan Garibi and his fascinating path as an origami artist. Several years ago his modular paper foldings were featured here and tessellated lampshades here. Since that time Ilan has continued to work with paper, and travels to conventions as an active member of the worldwide origami community. However, in recent years his interests have expanded beyond paper to include concrete casting and even metal sheets. 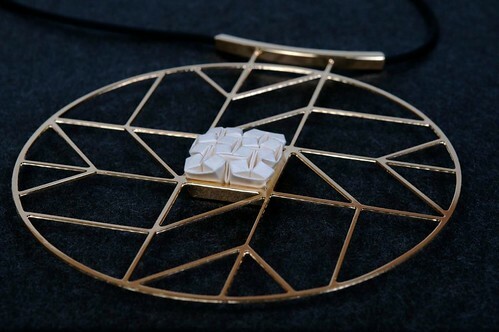 This past year Ilan has been creating fine jewelry based on origami crease patterns. 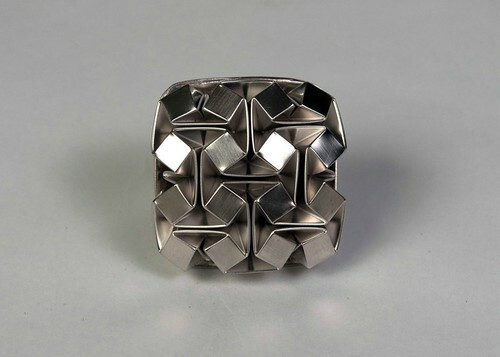 But before focusing on jewelry, let me briefly introduce the stunning home decor Ilan designed beginning in 2012, titled Tavolini / Metal Origami Collection. Comprised of furniture and wall art, it was made for Gal Geon of Talents Design Gallery, a developer and producer of contemporary luxury collections in Tel Aviv, Israel. 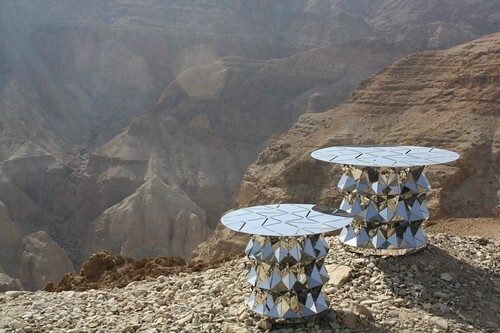 Here is just one example, a pair of highly polished stainless steel tables, as seen in a photo taken by Talents Design in the Judean Desert, east of Jerusalem. Notice the markings on the table tops... they depict the same crease pattern (the folding instructions, in a way) that Ilan used to create the bases, following a pattern of his own design. 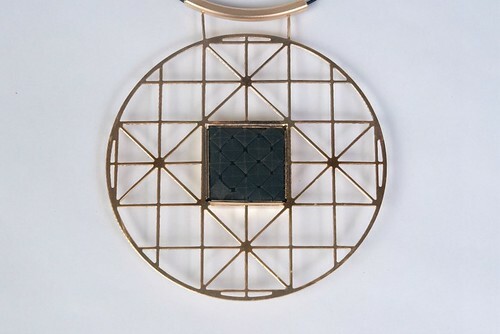 Similarly, this necklace's eye-catching geometric grid is the crease pattern for the elephant hide paper in the pendant's center. Here is another example from Ilan's Paper/Wood/Metal jewelry collection for Talents Design... a gold coated Rounded Cubes pendant. 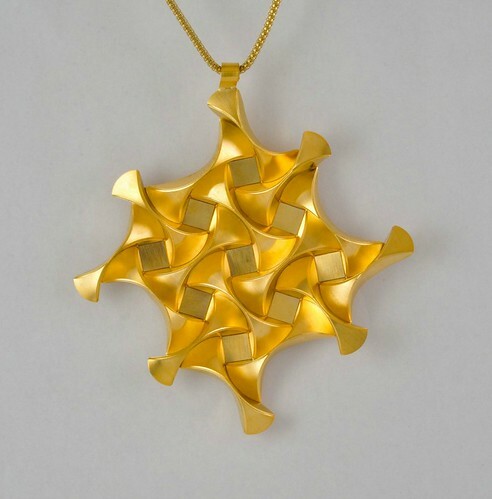 To make the pendant, he hand folded a sheet of brass using the tessellated pattern you see below. 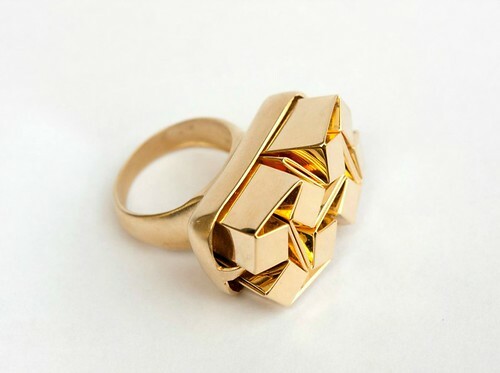 ...and a photo of a gold coated metal 2x4 Cubes ring to show the profile. 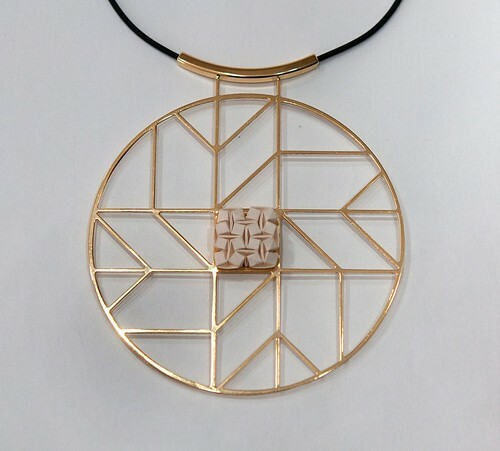 The crease pattern used to create the necklace below is different from the one at the top of this post, as you can see from the grid of squares and triangles that surrounds the folded paper center. 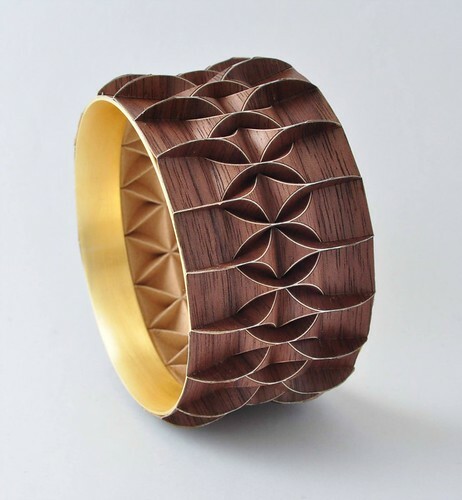 Lastly, a spectacular bracelet featuring small pieces of very thin, laser cut wood that are applied to the metal surface. The pattern is processed with photo etching, hand folded, and then the brass is coated with gold. Ilan does all of the steps required to make to these jewelry pieces, not just the folding pattern. "I really enjoy manipulating the brass with hacksaw, file and the burner." Continued success to Ilan Garibi as he continues to push the boundaries of origami by experimenting with non-traditional materials. He is also on Facebook. It's always nice to meet another person who enjoys origami. Nice work. What is your name? You already know that I think Ilan's work is amazing! Thanks for another great post about his work. I'm glad you enjoyed the post, Lisa. Amazing indeed! Amazing work. 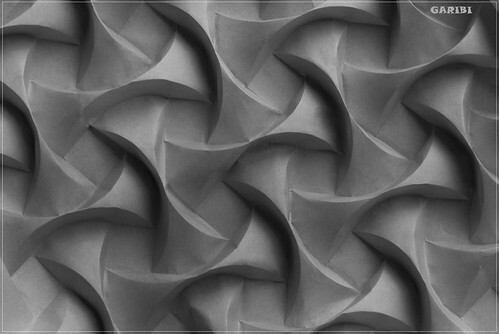 I have tried modular origami and tessellations and specially tessellations are difficult even on paper. Its fascinating to see these in metal! Very inspiring. Stunning jewellery designs!! !